Most American's have never heard of Reverse Osmosis water purification. And if they have, they probably don't understand exactly how it works. Simply put, the proper Reverse Osmosis water purification system is the most efficient and economical way to enjoy unlimited purified water in your home or office. 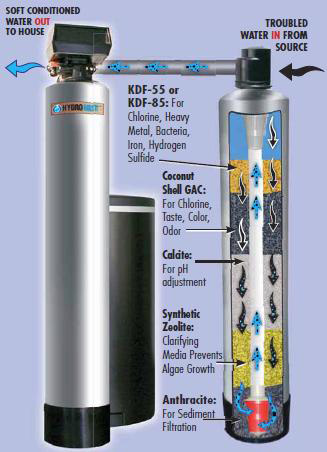 At the heart of the reverse osmosis process is a semi-permeable membrane which allows H20 to pass through it while rejecting dissolved solids, bacteria and viruses and forcing the water contamination to your drain. Our water purification systems are 5 stage units that produce up to 50 gallons per day of purified water for your home or office. This first stage is a wound polypropylene and in place to remove particles and sediment larger than 5 microns in diameter. These carbon blocks are similar to large refrigerator filters and are in place specifically to remove chlorine. 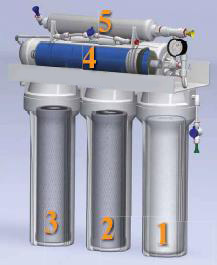 Note: These first three stages are called the 'pre-treatment' stages and are in place to remove things from the water that could damage the reverse osmosis membrane. This is the heart of the reverse osmosis process. This membrane removes dissolved solids, bacteria and viruses. This membrane purifies water. The rejected contamination is pushed to your drain line. This stage is in place to improve the taste of the water after being stored in the holding tank. These systems are fully upgradable (see our equipment customization section below) and come with a 4 gallon stainless steel storage tank and an elegant chrome purified water faucet. Also included are product, installation and service manuals as well as a filter housing wrench. Our equipment installs easily under any kitchen sink or similar space. Your purified water is fed to an additional faucet at your sink and to your refrigerator/freezer (if possible). Having 50 gallons per day of purified water at your disposal means you can use it for everything! All of your consumption needs: drinking, cooking, beverages and ice. And more: pets, plants, food preparation, appliances, cleaning, skin care, etc. Use purified water for anything! We always encourage individuals, families and businesses to do some research on your own about water quality and water treatment. The more you know, the more you know Pure Essentials has the best products, services and prices available. If chlorine or other contamination is a concern in your shower water, shower filtration is an affordable alternative to whole-house water treatment. Our shower filtration products include a filtered shower handle, an inline shower filter and replacement filters. The filtered shower handle is a detachable handheld on a 60" flex line. It has 5 different spray settings which can be adjusted to your preference. 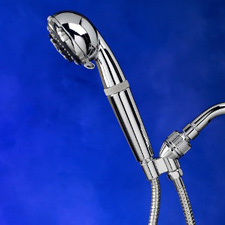 The inline filter attaches between your existing shower head fixture and it's water source. This provides the benefit of filtered shower water while continuing to use your own preferred show head. While this filter media does remove sediment and reduce cleaning necessary in your shower, it is primarily designed to remove chlorine. When you take a warm shower, the chlorine gas escapes from the water and can enter your body through your lungs and skin. Removing chlorine from your shower water is something that we feel is very important. Many people also have some level of allergic skin reaction to chlorine in shower water. Does your skin feel dry, itchy or irritated after showering? Chlorine may be the culprit! Get the chlorine out of your shower and enjoy softer, smoother skin and hair every day! Our multimedia conditioning systems are the most effective and affordable option for treating all of the water that enters your home or business. These units tie into the main line and condition the water before it enters the building. Our units are custom built. There are many kinds of water treatment media designed to perform specific water treatment functions. We build the types and amounts of media in your unit to treat your water specifically and ensure you achieve the desired results from your conditioner. Our conditioning systems resemble water softeners in appearance but excel in quality and performance. Some of the things our conditioners remove: Heavy Metals, Scale, Chlorine, Sediment, Odor and Discoloration. More specified treatment is available for specific contamination issues or pH adjustment. If you're not sure what you need, Pure Essentials would be happy to conduct a Free Water Quality Evaluation for you and make some suggestions on how to build your conditioning system. Water conditioning has many advantages. Mainly, conditioning your water preserves plumbing pipes, fixtures and water using appliances like hot water heaters, dish washers, washing machines and even coffee makers. By preventing buildup in your pipes and appliances, you reduce the risk of malfunction and damage leading to costly repairs. Keeping the buildup away also means your appliances will stay at 100% efficiency which can lead to big savings on power consumption. Our multi-media conditioning systems sell for less than half as much as lesser quality equipment from our competition. Please contact us for more information on our multimedia conditioning systems. 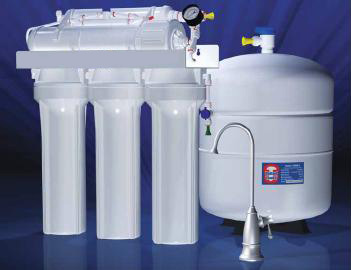 Pure Essentials has a full product line to treat any residential or commercial water treatment need. Our product line is too large to list everything, but should you or your business have specialized needs or requests, please contact us and we would be happy to accommodate. We use a bio-ceramic filter addition to add trace amounts of Magnesium, Calcium, Potassium and Sodium to your purified water. In essence, this additional stage transforms your purified water into a 'vitamin water'. Many people feel that pH basic or 'alkaline' water has significant health benefits. Should you determine pH adjustment is right for you, this additional stage keeps the pH of your water between 8.5 and 9 by adding trace amounts of calcium compounds to your purified water. 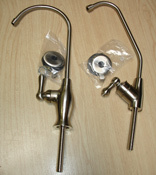 Our standard purified water faucets are an elegant chrome. This matches most standard faucet sets. Should you have a more customized color or style faucet set at your sink, we can custom order you a purified water faucet to match that color and style. If possible, we can run a water line from your purifying system to your refrigerator/freezer. If you have a refrigerator with a water dispenser or ice maker, these would be fed with purified water. This hookup also eliminates the need for any kind of other refrigerator filter, saving you money on those filter replacements. We highly suggest using purified water as your refrigerator's water source if possible. These U.V. lights attach to the purifying system as the first stage and are designed to instantly kill any living bacteria, viruses, amoebas or other pathogens present in your source water. These U.V. lights are suggested when your source water is from a well with no other microbial control or from an area with known microbial control problems. Simply put, Pure Essentials has the best products and prices in our area. Our equipment is customizable and the equipment price and maintenance costs can vary depending on how the system is built. We also offer a variety of discounts to eligible peoples. All of our equipment is competitively priced and available on a number of different payment options starting around $1/day. We work with you on an individual basis to find a purchase option that is right for you. If you have decided to take control of your water, please contact us to schedule your free, no obligation consultation.